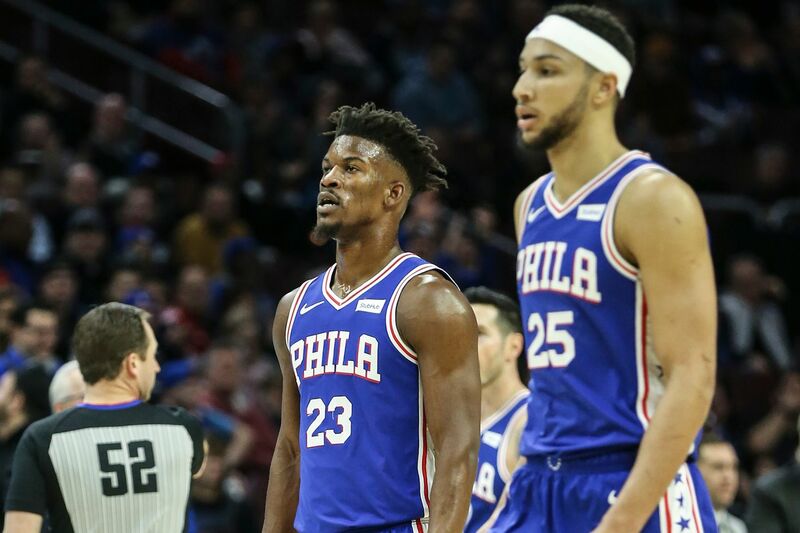 In order for the Sixers to seriously contend for an NBA title this season, they need Crunchtime Jimmy Butler to be All-The-Time Jimmy Butler. There’s probably a better way to phrase that, since the onus isn’t entirely on Butler to make that happen. But while you can phrase it any of a number of different ways, the essential truth remains the same. Beating the Celtics on a Wednesday night in late March is a lot different from beating them four times in early May. After Butler’s epic fourth-quarter scoring run and Joel Embiid’s 37 points and 22 rebounds propelled the Sixers to a 118-115 win over their long-time tormentors, the resulting endorphins understandingly overshadowed the uncomfortable fact that they needed every ounce of both performances in order to escape with a win. Even then, a half hour or so after the game, when Butler and Embiid and their head coach met with the media, you could hear the acknowledgment of the situation under-girding their comments. It was a great win, yes. But was it replicable? Perhaps not. With 10 games remaining, the Sixers’ top priority is to find a way to extrapolate the last quarter-and-a-half of Wednesday night’s win over the first 2 1/2 quarters of play. In a brief question-and-answer session with the assembled media on Friday, Butler wasn’t interested in sharing his thought on the matter. It was an understandable position to take, given that an honest answer might have required pointing out that one of the easiest solutions to the conundrum is to put the ball in Butler’s hands more often during the first half rather than waiting for the Sixers’ backs to reach the proverbial wall. After all, putting the ball in Butler’s hands necessitates taking it out of the hands of Ben Simmons, who is at his individual best when he is running the show, and who long ago erased any doubt that the point is his most natural position. Sixers' Jimmy Butler celebrates his late basket near Celtics' Kyrie Irving in the final seconds at the Wells Fargo Center in Philadelphia, Wednesday, March 20, 2019. Sixers beat the Celtics 118-115. Yet it has become increasingly clear that Butler is also most comfortable when he has the ability to dictate to the opposition. Frankly, it’s true of the vast majority of alpha players. One reality that is often overlooked in the arms race that the Warriors’ success has inspired in recent years. The secret to Golden State’s success isn’t just that they have three marquee scorers, but that two of those scorers are just as comfortable playing off the ball as they are with the ball. They are an anomaly in that sense. Far more common is the situation that the Sixers currently confront. It’s not the most enviable of positions for a head coach to find himself in. But it’s the task that Brett Brown must now figure out for the Sixers to reach the optimal version of themselves. “As I’ve said, and I’ll say it again, we will not be as good as we can be without [Jimmy Butler],” Brown said on Friday. “This is a fact. What he has done in fourth periods confirms [the] point." Perhaps the Simmons-Butler dynamic is best exemplified by a possession that occurred midway through the third quarter against the Celtics. After a made Boston free throw, Simmons inbounded the ball to Butler and jogged down the court to the low block. With Butler running the halfcourt offense, Jayson Tatum ended up playing the ball at the three-point line, allowing Embiid to set a ball screen and set in motion a pick-and-roll action. Both defenders ended up going with Butler, which drew Marcus Morris away from Simmons as Embiid rolled free down the lane. Butler made the right read, and hit Simmons with a pass for an easy bucket. It was the sort of play that simply does not present itself when Simmons has the ball in his hands and the on-ball defender is closer to the foul line than the arc. Throughout the second half, the Sixers took the ball out of Simmons’ hands and instead ran their offense through Butler and Tobias Harris, who both had considerable success operating in tandem with Embiid in the pick-and-roll game. At the same time, the advantages the Sixers get when Simmons has the ball in his hands are undeniable. Finding that balance will be a key for them as the postseason draws ever closer.